Superconductors.ORG herein reports efforts to increase the Tc of the 233K superconductive material, announced in March 2009, have been successful. 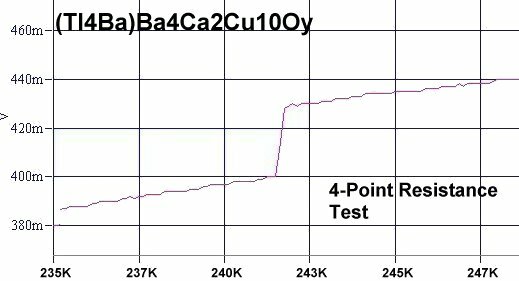 Producing a new world record near 242K (-24F, -31C), the host compound has the formula (Tl4Ba)Ba4Ca2Cu10Oy and is believed to have a 9212/2212C intergrowth structure (shown below left). The chemical formula is written (Tl4Ba)Ba4 to indicate an extra barium atom is being substituted into a thallium atomic site. The purpose behind this 20% substitution is to hole-dope the insulating layer. Potential heavy metal dopants with oxidation states lower than +3 included mercury, cadmium and barium. However, both mercury and cadmium create a topological defect in the structure due to their affinity for other atomic sites. This left barium as the best candidate for doping. Several magnetization tests confirmed a phase change in this material consistent with superconductivity. A sharp drop in magnetic susceptibility was observed between 248K and 249K, as can be seen in the above plot. 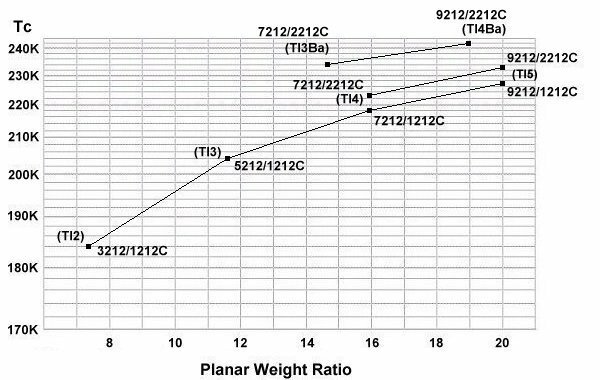 Since barium is lighter than thallium, the planar weight ratio of the 242K structure is lower than that of the 233 material (19:1 vs 20:1). However, the increased hole content overcomes this setback, producing a net gain in Tc. A weak resistive transition appeared near 234K in some of the R-T plots (as shown above). This is believed to result from a 7212/2212C structure forming as a minority phase. 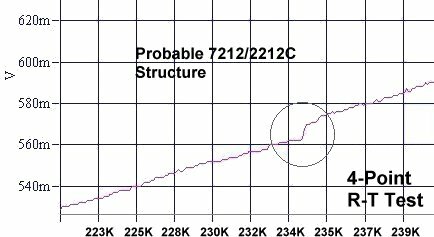 Plotting both the 242K and 234K signals based on the planar weight ratios of their structures yielded the below graph. The slope of the line linking (Tl3Ba) and (Tl4Ba) is not parallel with the (Tl4)-(Tl5) lines due to (Tl3Ba) being optimally doped at 25%, while (Tl4Ba) is under-doped at 20%. Note: Only whole number doping is viable in these intergrowth structures. The volume fraction of this 242K material is very low - likely less than 1% of the bulk. As such, before commercialization is possible, a refinement method will need to be developed to increase the VF. This discovery is being released into the public domain without patent protection in order to encourage other researchers to examine this material and its structure. 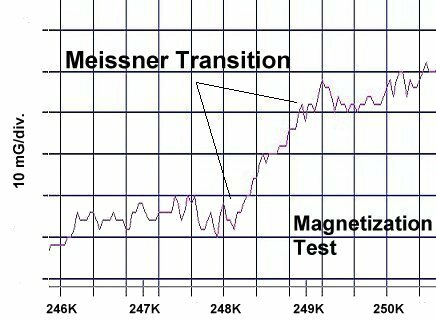 Numerous R-T and magnetization tests may be necessary to see the respective transitions above the noise. After 4 or 5 tests, the pellet may need to be dried out for a couple days before testing again. These "3rd day" tests often produce the best results.